There is a parable in the Book of Mormon in which the prophet Zenos tells of the master of the vineyard planting, grafting, pruning, and tending the olive tree and then of the variety of products that came as a result of the work. (See Jacob 5.) One gets many thoughts about the purposes of the Lord from this parable. Among these it appears that the Lord plants, prunes, and cultivates the garden of his children yet permits them to grow and become what they will, given good circumstance or poor. One gets the feel of agency and what it means. One also is impressed that the Lord has a storehouse of good roots on which to draw. Somewhere, one feels, in a time before the roots were ever planted on this earth, they were nurtured and selected. When one surveys the purposes of the Lord, one can understand the conditions that brought forth the latest of the appointments to the Council of the Twelve, Elder Bruce Redd McConkie. Let us gaze into the past. “The McConkie family was of an ancient honorable descent dating back one hundred years before Leif Ericson came to America. In the tenth century the clan landed its herds on the Highlands of Scotland where aided by right living they became a hardy and strong people.” Many years ago a modern apostle affirmed them to be of the best blood in the world. With others the McConkies left their native Scotland, emigrated to Ireland, and from there to America. Before 1793 Robert McConkie had emigrated to Pennsylvania and on to Ohio. One of his grandsons was George Wilson McConkie, born in Ohio October 26, 1846, the year the Saints were driven from Nauvoo. As a young man George Wilson McConkie started for California, but in Utah he found the gospel and joined the Church on April 2, 1874. He accepted the law of plural marriage and married three wives. On April 7, 1881, his second marriage was with Emma Summerville in the Endowment House. From this marriage was born Oscar Walter McConkie in Moab, Utah, May 9, 1887. Oscar McConkie grew to manhood taking part in all of the activities available to a young Latter-day Saint who intended to live his religion. With him was his teenaged son, James Monroe Redd, who had the job of keeper of the horses. Falsely advised that they could save time if they crossed the Colorado River by way of the Escalante Plateau, they started out only to discover that the direction they were going was more likely to lead to disaster. It looked impossible to cross the deep canyon of the Colorado but still they persisted. They finally found a cleft in the cliff, not quite wide enough for a wagon to enter, but which led not quite perpendicularly down the cliff to the Colorado River. Somehow they widened the cleft until they could squeeze the wagons through, then constructed a road down the cliff at an angle, using wooden pegs driven in holes in the sandstone cliff to support one side of a riprap of poles until miraculously every wagon was brought down to the floor of the canyon. One looks at that “Hole in the Rock” today and says they could not possibly [text missing] wagons and their teams at one time and with that ferried the wagons across the river to the east side. People had said they could not do it. Climbing out of the canyon on the east side, crossing the sandstone ledges, cliffs, drop-offs, washes, and sand to the San Juan River was equally impossible. The wagon train went through. Should they turn back when they first discovered the difficulty of the land? The answer was, “No!” And so after many weeks﻿—nay, six months (October 1879 to April 1880) they did what lesser men said they could not do. They were proving their preexistent heritage﻿—they were good roots. Bluff and Blanding, two towns, were established by these determined and intrepid men and women. The establishment of settlements did not end their difficulties. Crisis after crisis was met﻿—Indians, floods, sand, storm, sickness, death﻿—with a firm faith that the Lord had sent them there by the mouth of his prophet and would preserve them through their afflictions by their righteousness. Oscar W. McConkie and Margaret Vivian Redd ripened their acquaintance at Utah State Agricultural College in Logan, Utah, and were married September 13, 1913. They moved to Ann Arbor, Michigan, where Oscar entered the University of Michigan Law School. There, on July 29, 1915, their first child, a son, was born. He weighed ten pounds. He was named Bruce Redd McConkie. His entrance into this world was difficult, and in the process both he and his mother nearly lost their lives. A year later at the conclusion of law school the family moved back to Monticello, where the father began to practice law. Life in Monticello for a small boy was normal. Bruce was ordained a deacon at the age of eleven and three-fourths (February 27, 1927). About this time the family returned to Ann Arbor for a year of law study. Bruce taught the Book of Mormon in the family Sunday School. By this time the family had increased. The children in order of their entrance into the world include: France Briton, now a prominent Salt Lake attorney, named in honor of the World War I allies; James, an excellent musician﻿—since deceased; Margaret﻿—Mrs. Bill Jordon Pope﻿—a gifted teacher formerly in the elementary schools and now teaching in the Church organizations; Oscar W., Jr., now president of the Arizona Mission; and William Robert, a young attorney. All of these hold or have held high Church offices. On their return the family settled in Salt Lake City. Each summer they went to Monticello, Utah, to be on the farm until school began in the fall. Bruce learned all of the farm skills: handling horses, milking cows, raking hay, and helping generally. He was truly raised on the farm. During these growing years in Salt Lake City, he patronized heavily the public library and read avidly many books for boys. Among his favorites were the works of Ernest Thompson Seton, whose animal stories excited the imagination of that generation of boys. Breathing, talking, and living the principles of the gospel made life in the McConkie home a constant joy. Meals were served family style. Father McConkie was an expert at making just the right conversation. Gospel subjects were the chief topics of discussion. The truth was carefully taught, repeated over and over in many ways, until real love of the doctrine came into their lives. Sundays were faithfully kept. At Sunday dinner each one told what he had learned at Sunday School, and the father added what he deemed necessary to illuminate the subjects discussed. The family car was put away for the day. All walked to and from the Sunday meetings. The neighborhood was healthy and the boys added to its vigor. They engaged in boyhood neighborhood activities. Oscar W. McConkie’s habit of talking to his family on the gospel was an integral part of home life that he carried on with his children until he died. As time went on and the family spread its wings, weekly gatherings of father and sons were held. He sought truth with singleness of purpose and he would have nothing else. Vivian McConkie was an able and active complement to all that he did. He had faith﻿—she bound it with love. He had the priesthood﻿—she brought to it patience, charity, and virtue. Bruce’s high school days were spent at the old LDS University located where the Relief Society Building and the General Church Office Building now stand. He was graduated in 1931. Three years at the University of Utah swiftly followed. There, in the fall of 1934, came his call to the Eastern States Mission. October found him on his way. He had read the Book of Mormon three times, had read the other standard works, and had had the long years of family discussions. He had patterned his life to the truth. He was ready when the call came. He had all of the usual experiences a good missionary had in that mission. There were times when patience was the order. There were times when vigor should be exercised. There were times of crisis. Elder McConkie was ready for each. He enjoyed one of the splendid old-time mission presidents, President Don B. Colton. The fall of 1936 found him at the University of Utah Law School and he received his B.A. degree in the spring. His education there would continue until he received his LLB. He had met Amelia Smith, daughter of President Joseph Fielding Smith, while he was a university freshman and she a junior at East High School. A little later Bruce was at a party at the Smith home on a Saturday night. As it neared midnight he excused himself and departed in time to be at his own home before Sunday morning. Sister Smith was much impressed by this obedience to parents and principle and told Amelia that this young man would be one to watch. Amelia found it easy to like this affable man of six feet five inches in height with the booming voice and infectious laugh. He found it easy to fall in love with this charming girl with features reminiscent of her great-grandmother, Mary Fielding Smith. They were married October 13, 1937, in the Salt Lake Temple. He still had two years of law school before him. After marriage they began to read scripture together. She read the King James Version of the Bible aloud while he marked all of the changes made from it in the Inspired Version. This habit of reading together each night they continued until his call to the First Council of the Seventy in 1946. By then they had gone through the standard works several times. Sister McConkie had been keeping house for her father and brothers after her mother’s death. After the marriage they moved into a basement apartment in the Smith home and she continued this service to her father and brothers until President Smith married Jessie Evans. After graduation from law school, Elder McConkie was assistant city attorney for two years. World War II began at Pearl Harbor December 7, 1941. Believing in the inspired destiny of this country, Elder McConkie had joined the ROTC during his university days. He served in that organization for four years. Then when the war started he served four more years on active duty in the Ninth Service Command. He began his service as a first lieutenant and retired at the end of the period a lieutenant colonel. His work was in security and intelligence. On his return he became an editorial writer for the Deseret News until October 6, 1946. The call as a member of the First Council of the Seventy came to him on October 6, 1946, by President George Albert Smith. For the remaining twenty-six years of his membership in that council his loyalty, devotion, and contribution to the progress of that body cannot be measured. As with many, he and Sister McConkie have had sadness in their family life. Their first child, a son, Bruce Redd McConkie, Jr., died after only a few weeks of mortal life. Other children were given to them, however, until they have been like the psalm of old which says, speaking of children, “Happy is the man that hath his quiver full of them.” (Ps. 127:5.) They have been blessed with eight more children: Mrs. Vivian Adams, who is the YWMIA president in her ward in Illinois; Joseph Fielding, who is now working on his Ph.D. at Brigham Young University; Stanford Smith, who is now working on his Ph.D. at Washington State University in Pullman, Washington; Mrs. Mary Ethel Donoho, who holds a masters degree and is teaching in the Relief Society of her ward; Mark Lewis, who is attending the University of Georgia and working on his Ph.D.; Rebecca, a senior at Brigham Young University; Stephen Lowell, a missionary in the Australia West Mission; and Sara Jill, a junior at West High School. Five of the children have served missions. The living grandchildren number ten and have become the center of their family lives. he would from memory add the appropriate scripture and material supporting the outline. He had memorized a verse of scripture a day while in the mission field, and so he had a large amount to draw upon. Doing this daily as he walked gave him practice in analysis and logic of doctrinal subjects. Discussions with Sister McConkie and many of his friends sharpened the ability. He continued this until this method of thinking has become second nature to him. The work Elder McConkie has done while a member of the First Council of the Seventy has been prodigious. Besides going to stake conferences weekly and touring missions, he served as servicemen’s coordinator for fifteen years. He has served as managing director of the stake missions and of the full-time missions. He served as mission president of the Australia South Mission from 1961 to 1964 when it encompassed all of western and southern Australia. His work there was monumental in scope and was marked by many progressive methods that enlarged the mission’s influence. His missionaries learned from him sound doctrine and testimony. They learned determination and perseverance. They learned what it is to be humble and to hear the whispering of the Spirit. Sister McConkie was by his side in this great endeavor. It was one of the happy, rewarding periods of his life. He has written numerous articles and handbooks and read hundreds of manuscripts submitted for his appraisal. His sermons at conferences have been consistently doctrinal in nature, pointing out the basic gospel principles that lead to exaltation. He has truly taught that to know God and his Christ is to have life eternal. He has raised his voice in many lands as he has toured missions. His value in counsel has been wise, clear, and in harmony with the true principles of the gospel. His gift to write and speak concisely and with clarity amounts almost to genius, and he exercises these gifts willingly for the benefit of the work of the Lord whose name he reveres. 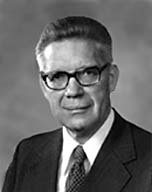 During his years in the First Council, he has found time to write four volumes of doctrinal studies and to edit three volumes of the doctrines expounded and explained by President Joseph Fielding Smith. * These books, exhaustive in treatment and clearly written, reveal the clarity of the mind, the logic of the presentations, and the guidance of the Spirit in their composition. These stand as bulwarks defending true doctrine against the nebulous assertions of modern philosophers. Available leisure time is given to searching out, polishing, and shaping rocks. He is an avid lapidarist. Several times he has been in danger in his efforts to extract valuable rocks from the holes and cliffs where they are found; and once his life was spared miraculously as the Spirit of the Lord prompted his pulling back as a mass of rock fell just where he had been. He enjoys hiking and taking long walks with Sister McConkie when she can go and alone when she cannot. To see him outlined against the sky five hundred feet above one on a high ridge is to get a glimpse of the physical power in his body. There also one senses that his powers﻿—physical, mental, and spiritual﻿—have been given him by the Lord in great abundance. One senses too that these powers are reserved, dedicated, and consecrated to the service of his Heavenly Father and to the Lord Jesus Christ and to none else. Other matters of life have importance, of course, and receive attention, but nothing can interfere with his search to find out about God. Like Nephi of old, his thirst is to receive the vision of his tree of life and to live to pierce the veil himself. He is impatient with half truth and intolerant of untruth. The way to righteousness is a clearly marked road of scriptural and revealed truth. He will have nothing else. And what about Amelia McConkie? She has stood by his side, a true helpmeet. In their young married life when money was scarce she enlarged it by her skill in handling a home, in cooking, sewing, and household work. With eight children to care for, she found time to be by his side on hikes, camps, socials, and in the physical labor of making a home. She is an expert seamstress and has for years made her own clothes as well as those of her girls. Sister McConkie has taught in Sunday School, Primary, and YWMIA. She was a stake Relief Society president before going to Australia and on her return held the same post in a university student stake where she is revered by hundreds of young women. She is presently teaching the Relief Society social relations lessons in her ward. She has brought to the home culture and womanly refinement. The music of her piano has filled the house, and her landscapes hang with happy color on her walls. She is an excellent lapidarist and makes beautiful jewelry for her friends. She reminds one of Mary Fielding Smith in her courage and devotion and loyalty to principle. She is as strong in these virtues as was her great-grandmother. She upholds her husband as head of the home and teaches her children that she and they are under his presidency. As one enters her home, one sees her in her true place, a devoted mother who is indeed the queen of the household. She is a noble example of Latter-day Saint womanhood and a worthy helpmeet to her husband. Out of the mouth of her youngest daughter comes the whole sum of the home she and Elder McConkie have created. Sara said that when she gets married she hopes she can have as much fun as Daddy and Mother have had. And one is sure of the love and security of this home when one calls on the phone and asks if President McConkie is at home and is told that, yes, he is home and is teaching and explaining the Book of Mormon to Sara. Though only one child is left at home, she receives the same careful attention as though all eight were there. These are the simple things, the homey things, the spirit overruling all. No man can be portrayed accurately by another. He must be his own interpreter of his hopes, his aspirations, and his ideals. So that none can misunderstand his motive and the fire that drives him, let him now speak for himself what is uppermost in his heart. “Let it now be written once again﻿—and it is the testimony of all the prophets of all the ages﻿—that he is the Son of God, the Only Begotten of the Father, the promised Messiah, the Lord God of Israel, our Redeemer and Savior; that he came into the world to manifest the Father, to reveal anew the gospel, to be the great Exemplar, to work out the infinite and eternal atonement; and that not many days hence he shall come again to reign personally upon the earth and to save and redeem those who love and serve him. Doctrines of Salvation, by President Joseph Fielding Smith, compiled by Bruce R McConkie: volume 1, 1954; volume 2, 1955; volume 3, 1956. Mormon Doctrine, A Compendium of the Gospel, 1958. Doctrinal New Testament Commentary: Volume 1, The Gospels, 1965. Volume 2, Acts–Philippians, 1970. Volume 3, Colossians–Revelation, 1972.